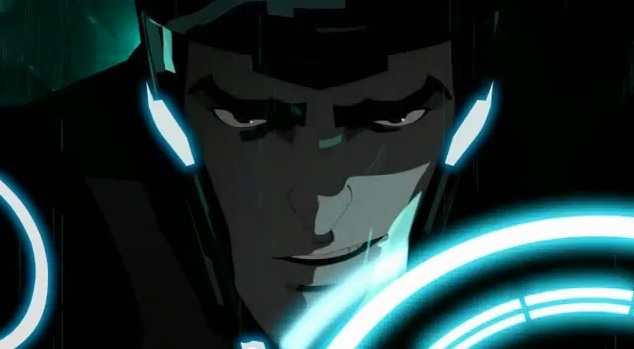 This thread is to discuss the TRON: Uprising episode "The Reward",which airs October 19, 2012. Discuss away!!! I have a feeling Beck will fight Tessler again in this episode. Beck must save a program who has been arrested after being wrongfully accused of being The Renegade. I have a feeling we'll be seeing Cutler in this episode. Well, I seen to remember that in one of the trailers for Tron Uprising there was a fast scene of a very scared female program running away from the black guards, so maybe it's her they think is the renegade? TRON.dll Wrote:I take it you enjoyed the episode. Very much so. I'm impatient for it to come out on iTunes. Should be in the next couple of hours. Same here. Waiting (im)patiently for it to pop up on the Playstation Store. *bubbles absently, is stepped in* Ouch. *is scooped into bowl and put in fridge to resolidify* I have to remember to pick up an iTunes card sometime this weekend. I use gift cards instead of connecting directly to the bank account. One only gets one's password stolen once before one learns to take precautions. I got access to the three games the person bought, but they're for an iPod touch, so I can't even play them. Sigh. Oh! It's here! *goes to buy it* And now....I wait for it to download. renderinfo Wrote:For some strange reason, my Comcast DVR did not pick up the Rewards episode that supposedly aired Oct 19th. I rechecked and the SCARS Oct 26th episode is marked as scheduled to be recorded, so we will see. In any case, I found a site that streamed it on-line as well as a torrent of the episode (both of which I think are now off-line), so I was able to watch it in all it's HD glory. VERY COOL CAR!!!! You see it in the trailer for Rewards, but to see it in action, wow. Sorry I didn't do any screen grabs yet. Overall the episode was enjoyable, but this is the first one (to me) that seemed very fomulaic. It might have been cooler if Tesler shook up his own ranks at the end, rather than just return everything to the "status quo". At least the episode introduced a (yet another) very cool new Grid Vehicle!!!! Oh, I think Tesler is going to have more problems when "Scars" begin. Clu is sending someone to Argo City without Tesler's permission or knowledge (if that's what it looks like), then he's going to realize his glory is going to be stolen. I think CLU knows that Tron is hiding out and that he's sending Dyson to shake him up. I had no idea it was available on PSN! I just bought the 7 available episodes in HD and they are downloading as I type. I had to pay. $2.99 per HD episode. Standard definition also available for $1.99 per. If it helps support the series then I'm all for purchasing this every week. Plus it's worth it to me since there are no commercials or pop ups, plus the obvious fact that it's 1080p! BanditTron Wrote:I had to pay. $2.99 per HD episode. Standard definition also available for $1.99 per. That's $2.99 per HD episode OR $2.99 for both HD and SD versions in a bundle! You'll probably never use the SD ones but you can still get them. Better than not getting them. Actually, I guess if you were to take your PS3 to a friend's house to watch Tron Uprising, and your friend doesn't have an HDTV, the SD episodes would come in handy there. Overall the episode was enjoyable, but this is the first one (to me) that seemed very fomulaic. ! Exactly my opinion, I was expecting a great chase after escaping the colliseum, but after that the episode...ends. Anyone else noticed how VIOLENT the show is getting(Wich is awesome) ? The poor black guard cut in half and screaming desesperately HELP ME! HELP ME! while he is derezzing is something, but the way they wanted to execute the programs at the end? Stretching them until they broke in pieces? That was a method of execution in the medieval times! This series is getting away with things not even Legacy could. And another thing, I may be wrong, but when the car splitted in two, was that the super lightcycle from Tron 2.0? (Have we seen a sub yet? I don't recall). 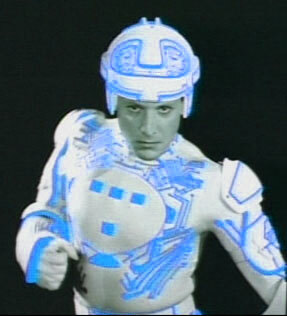 Yeah, Tron piloted a sub to help Cutler and Beck escape from Tesler's battleyacht thing in The Renegade, pt. 2. The derezzing Black Guard in Tesler's nightmare was an interesting touch, projecting Tesler's own cruelty onto the renegade, but I was unimpressed by the execution scene; it didn't feel very to me, as opposed to, something like "progressive decompilation", which would require some imagination from us, the viewers, to conceive of how horrible that would be for a program. But I guess it's well-established that Tesler is a sadist and a sociopath (or the programmatic equivalent). On the opposite side, even though the show is ramping up in terms of darkness and violence, the renegade never derezzes anybody? C'mon - it's beginning to be difficult to suspend my disbelief. Even the disintegrated-by-lightcycles execution scene would have rung a bit more true if Beck had derezzed one or two of the light cycle riders while freeing Zed, Mara, and Hopper. I find myself kind of hoping it's Beck that sends Tron around the bend into Rinzler-ville. emdeesee Wrote:On the opposite side, even though the show is ramping up in terms of darkness and violence, the renegade never derezzes anybody? C'mon - it's beginning to be difficult to suspend my disbelief. Even the disintegrated-by-lightcycles execution scene would have rung a bit more true if Beck had derezzed one or two of the light cycle riders while freeing Zed, Mara, and Hopper. It's pretty obvious that Beck goes out of his way not to derezz people(see "Identity"). I think that one of the reasons is that he doesn't want to become what he's fighting against. Not to mention, it wouldn't be a very good kid's show if the hero went around killing people. emdeesee Wrote:I find myself kind of hoping it's Beck that sends Tron around the bend into Rinzler-ville. I like the fact that Beck doesn't kill , it sets him apart from Tron who won't hesitate to freaking Break you in half to defeat you.